The Wall Street Journal points out that the correlation between inflation and gold price movement is extremely small. This suggests that there is a popular misconception that gold in a hedge against inflation. See the following post from Expected Returns. 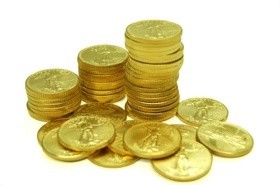 Regular readers of this blog know my views on gold ar e unconventional. I've repeatedly said that gold is neither a commodity nor a hedge against inflation. I've instead opined that gold is a hedge against government stupidity and fiscal mismanagement. Most people believe the conventional wisdom that gold is a hedge against inflation, which is why most people have missed the decade-long bull market in gold. Amazingly, people refuse to amend their errors and continue to call gold "expensive." I, for one, beg to differ- ignorance is expensive. That being said, the Wall Street Journal finally came out with an article on gold worthy of publication. The article questions conventional wisdom and introduces a radical concept (at least when it comes to the WSJ and gold): analyzing actual data before coming to conclusions! Thinly veiled sarcasm aside, here are some excellent points from the article. I recently asked research firm Ibbotson Associates to run a correlation study to determine how closely inflation and gold-price movements track each other. You would expect gold, as a purported commodity, and inflation to move in tandem. The data, going back to 1978 and capturing an inflationary spike, shows a correlation of, at most, 0.08. That is low. Really low. Perfect correlation is 1; at minus-1, two assets move in perfect opposition. Near 0 implies gold and inflation barely acknowledge one another, and moves in unison are largely happenstance. So if inflation doesn't push and pull at gold prices, what might it be? If you believe correlation studies, the answer is the U.S. dollar. Going back to 1973—a period that defines the modern, non-gold-backed dollar—the greenback's movements closely track gold's direction. The correlation between month-end gold prices and the Major Currencies Dollar Index, as reported by the Federal Reserve, is minus-0.45. About 1% of the population understands that gold's main role is not to hedge against inflation, but to hedge against the government. Rising gold based on collapsing confidence, and not inflation, is a historical phenomenon. This is a critical point to understand since few would disagree that confidence in government is waning. ...Over the past 30 years, the correlation between the dollar and gold is minus-0.65—a high negative correlation. It means the dollar and gold are effectively on opposite ends of a seesaw. When the dollar is in favor, gold retreats. When it is under pressure, gold prices swell. Look at the nearby chart. It is like a photo of a mountain scene reflected in a tranquil lake. The rises and falls and horizontal meanderings of gold are nearly the negative of the dollar's. The implication is that gold isn't a commodity—at least not one that hews to the definition of something that people and industry consume. Instead, "gold is a currency" whose daily price is a gauge of the market's concern about the "potential diminishment" of the purchasing power of the dollar and other paper currencies, says Paul Brodsky, a principal at New York's QB Asset Management. I've recently made the point that the big swings in inflation are based on dollar movements. In other words, inflation is not solely an internal phenomenon; it can arise from exogenous shocks in foreign exchange. So a global collapse in fiat currencies will create inflation in America. The bigger the collapse in global confidence, the bigger the inflation. This is why I like to say that inflation is currency-driven. Those who predict collapsing gold prices are missing the big picture. Collapsing gold prices imply a substantial rise in confidence in government. Let this statement sink in. How anyone can argue for a rise in confidence in government is beyond me. I'm simply doing research on the web to undesrtand more fully the role of gold in the economy. Thanks for your refreshing article, which stands out from the crowd. In Vietnam, gold is trading at higher prices than in the rest of the world. What are your thoughts on this phenomenon?